One of the grand annoyances with digital photography—a problem that was much less severe in the days of film photography—is that when it comes to image quality, tiny, portable point-and-shoot cameras can’t touch the quality from their bigger, harder-to-carry digital SLR (single-lens reflex) brethren. Some people spend a lot of money on an incredible digital SLR that because of its bulk never leaves the house. Could there be another way? 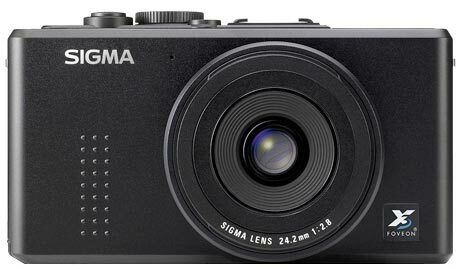 The camera and optics company Sigma has designed two point-and-shoot cameras with large image sensors to fill the breach, the DP1 and DP2. Before continuing, it’s important to note that the lens is the primary difference between the two Sigma cameras. The DP1 has a 16.6mm (28mm film equivalent) f/4 lens and the DP2 has a 24.2mm (41mm film equivalent) f/2.8 lens. The wider, slower lens on the DP1 makes it more suited for outdoor group shots, environmental portraits, and landscape images. The DP2 is more suited for traditional portraits and lower-light situations. Neither camera’s lens is removable; both are optically impressive. While the DP1 and DP2 look identical, a few buttons have been moved around, menus changed, and some functions sped up on the DP2. But for all practical purposes, it is the lens that differentiates the two. And though the DP2 offers ISOs up to 3200, while the SP1 only goes up to ISO 800, the higher ISOs on the DP2 aren’t actually very useful. So for the rest of this review, I will refer to the cameras together as the “DP cameras” unless one warrants separate discussion. In my experience, the DP cameras live up to the image quality hype: they pack SLR quality in a point-and-shoot package. The comparison to an SLR isn’t arbitrary—the DP cameras have SLR-sized sensors, covering 7 to 12 times the surface area of a typical point-and-shoot camera. When compared to cameras that have the same physical size, the DP cameras produce better colors, sharper images, less pixilated enlargements, and lower noise. The other advantage to such a big sensor is the ability to isolate the subject of your image with a nicely blurred background. Though this “professional look” has been fetishized in recent years, it’s wonderful to have the option to make shallow depth of field images, and I was astonished at how well both DP cameras (though to a greater extent the DP2, due to its wider aperture and longer focal length) excelled in this regard. The cameras’ shadow detail, dynamic range, and color accuracy are all top notch, but bump the ISO up to 800 and the images start to get overly noisy. The amount of noise isn’t terrible, but it’s not up to par with SLRs, most of which can shoot at ISO 800 and produce very clean files. Most digital camera sensors are pocked with millions of photosites that each record only a single color (red, green, or blue). This classic design is known as a Bayer mosaic, and theoretically results in color inaccuracies and decreased resolution due to the fact that the final color of each pixel in an image is an estimate based on the recorded value of the corresponding photosite on the camera’s sensor and that photosite’s neighbors. But these color differences are hard or impossible to spot in most real-world situations. The DP cameras (in fact, all of Sigma’s current cameras) use a totally different sensor technology that the company calls Foveon X3. Since different wavelengths (colors) of light penetrate silicon to different depths, X3 sensors use three layers to record actual red, green, and blue color values at each photosite. There is no need to estimate. This breakthrough was supposed to revolutionize digital photography, but it hasn’t entirely delivered on its promise, and has even introduced some problems. Since the technical underpinnings of processing raw images from an X3 sensor is different than that of processing raw files from a Bayer sensor, third-party support for Sigma raw files has lagged. For example, the DP1 has been out for over a year, and Apple’s Aperture and iPhoto still won’t recognize or let you work with its raw files. (If you shoot in JPEG format, you won’t have any problem.) Adobe Lightroom and Photoshop can open the DP1’s raw files, but support for the DP2’s raw files are in the beta stage. 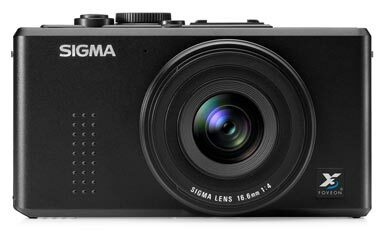 Sigma’s own raw processing app included with the cameras, Sigma Photo Pro, is limited and clunky. But the native JPEG output of the DP cameras, at 4.7 megapixels (2650 x 1750 pixels), doesn’t tell the whole story either. The actual spatial resolution is somewhere between those values, and many photographers agree that the sensor found in the DP cameras compares to a typical Bayer sensor in the 9 to 10 megapixel SLR range. My own experience confirms this, having had no trouble using the cameras to produce stunning 8-by-10-inch and 11-by-14-inch prints. The DP cameras are solid rectangular boxes, eliciting some of the feel of an old-school rangefinder camera. The plastic feel of the lenses and the growling noise of the lens extending or focusing detract a bit, but are minor issues. Whether the relatively small size of the DP cameras will impress you depends in part on whether you’re used to an SLR or point-and-shoot. When turned off, both DP cameras are about 1.25 inches thick, with the lenses protruding by another .75 inches. That’s a pretty slick package, and they’re easy enough to slip into a coat or cargo pocket. But turn the DP cameras on, and their lenses telescope out by another inch. With exposed glass on the front—the DP1 suffers from this more than the DP2—neither camera feels so compact, or as safe to leave on in a pocket or dangling over a shoulder. If there is one place where Sigma failed, it’s handling. The DP1 takes ages to focus and ages to save an image to the memory card, and is marred by a terrible menu system. The DP2 has made incremental improvements in these areas, but can’t allay the majority of my complaints. In addition, I’d love to know who decided that black buttons on a black body with engraved black labels were a good idea. The LCD on the DP cameras feels like it is a few generations old: low resolution and low contrast, with bizarre color shifts. For myself and many others, the poor handling of the DP cameras will be an unfortunate deal breaker. The Sigma DP1 and DP2 produce the most outstanding low ISO (100 to 400) images of any compact camera I have ever used. Their image quality is truly on the same scale as entry-level SLRs. You get sharp, accurate colors, wonderful tonality, and the ability to isolate your subject with shallow depth of field—all in a package that resembles a rangefinder and slips into a jacket pocket when turned off. But unless you’re incredibly patient with clunky controls, and shoot images of static subjects (or equally patient significant others), the superlative image quality of the DP cameras won’t matter, because you may not capture the image (or even try) in the first place. The portability versus image quality paradox has been replaced by a usability mess. For the price, the DP1 and DP2 are difficult to recommend to anyone but the smallest niche of users: those who will be happy with superlative image quality at one of two focal lengths, on a camera with some of the worst handling characteristics in a point-and-shoot package. Oh, and they have to be willing to shell out for the privilege.